The post-holiday publishing slump is here: I have no interesting new cookbooks to report on, and the only notable book on food is Mark Bittman’s Food Matters, but I think tablehopper readers already know what to eat and why. From Seattle-based publisher Sasquatch Books and LA-based author Jenn Garbee comes this introduction to a brave new world of food. Herein are profiles of ten underground eating experiences, the chefs that make the food, the recipes themselves, the various spaces that house the meals, and a few dozen black-and-white photos for flavor. 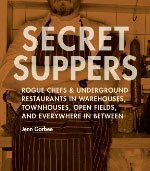 The ten secret suppers profiled take pace in our very own Cole Valley; and in Sonoma; south Seattle; Manhattan; Washington, D.C.; Dundee, OR; Des Moines, IA; various farmer’s fields in CA; and LA. They vary widely in price, style of food, formality, alcohol policies, and the necessity of wearing clothes. A fun, informative peek into a unique subculture of food and cooking.